Sometimes our gospel is just too small. If we’re not careful, we can take a story about Jesus rescuing creation and reduce it into a story about ourselves. We can turn stories into statements, and poems into punch lines. We can miss the sweeping, triumphant, heartbreaking, and glorious stories that make up the gospel of God. But the biblical gospel, the real one, is a stunning mosaic of GodStories. It’s about sins forgiven, shame removed, beauty restored, and meaning reinstated. It’s about God’s kingdom, his mission, his temple , and his victory. It’s an epic love story that starts with betrayal and ends with a wedding, but it’s also a thriller where the hero fights to save the world against impossible odds. It’s massive. It’s a sweeping drama of GodStories from start to finish. Welcome to the gospel of God. 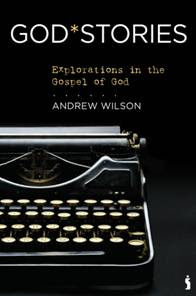 About the author: Andrew Wilson holds degrees in theology from Cambridge University and London School of Theology. His passion is to communicate the extraordinary truths of God. Andrew teaches internationally and is an elder at Kings Church Eastbourne in the UK, where he leads training and development. He is also the author of Incomparable: Explorations in the Character of God and lives with his wife, Rachel, and their son, Ezekiel, in the UK.